Whether you're in a live situation or in the studio, things can suddenly sound distorted, or there could be no sound output at all. You can spend a lot of time chasing your tail trying to find out what's wrong unless you have an orderly procedure to follow that allows you to troubleshoot the system quickly so you can get back making music in short order. And that's not even talking about all the excellent attributes of a fine digital console that's one of the easiest to use in the business. That being said, here's the excerpt about troubleshooting your system from the book. "If something doesn’t appear to be working or if the sound is noisy or distorted, here are a couple of checklists to help you get to the bottom of the problem. Is the mic plugged into the correct channel? Select the Input meter button to see if the mic is registering on another channel meter. Repatch it to the correct channel if it is. Is the Mute switch on the channel engaged? Is the Firewire or Digital [recorder] input button selected? Is the Mic/Line control raised high enough? Raise its level more. Is the master fader at zero? Is there an outboard device connected to the insert of the channel? Disconnect it to see if the sound returns. If it does, the fault lies with the outboard device or its cables. Is there sound getting to the output? If you have meter deflection but no sound, the problem could be the amps or speakers. If you’re computer is connected to StudioLive and you’re running VSL, open up Smaart and use to the Output Check as described in Chapter 12. Are other mics distorted too? If so, check to see if the amplifiers for the sound system are overloading. Also, check to seen if a speaker is blown. Is the Mic/Line control set too high? Is distortion occurring somewhere else in the console? Are any overload lights on anywhere in the system? Follow the above proceedures and you should find your problem with a minimum of time spent. 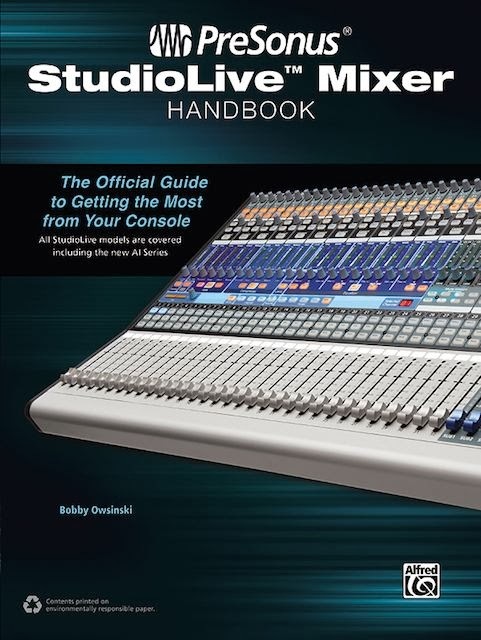 To read additional excerpts from the PreSonus StudioLive Handbook: The Official Guide and my other books, go to the excerpts section of bobbyowsinski.com. Are There People Who Take No Pleasure From Music?